If there's one thing you can rely on when it comes to British weather, it's that it's going to be unreliable! Keeping your work areas clear, safe and ready for business will be easy and economical with our forklift snow plough attachment, which will make light of the most Arctic conditions! It has a 1500mm wide blade in 6mm steel plate, attached by means of screw down clamps, and comes complete with a reversible bolt-on rubber wear strip and a heavy duty safety retaining chain. 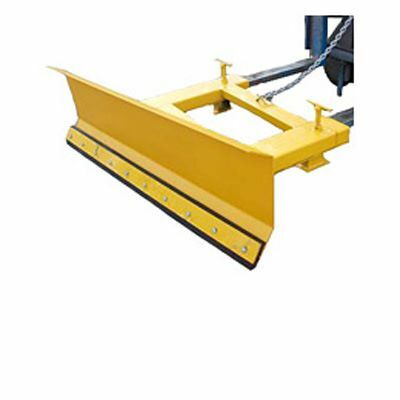 For a long working life, this snow plough attachment for forklift trucks has been given a durable powder coated finish in yellow. Save money by buying with one of our towable gritters!